India has 7,500km of coastline with diverse habitats and rich biota. Coastal ecosystems, unfortunately, are experiencing wide range of pressures due to siltation, eutrophication, coastal development, aquaculture and climate change. Those species that adapt to these pressures will expand their living boundaries while others may fade away. Accordingly, the study of coastal biodiversity is of great concern globally and constitutes an important element of global change research. Gujarat has 1,600 km of coastline, reportedly with rich diversity of seaweeds. Previously published accounts on seaweed biodiversity were mainly in the form of checklists, the earliest among these being the checklist of Krishnamurthy and Joshi prepared in the early 1970s. The more recent checklists are based almost entirely on secondary information. The present book entitled Seaweeds of India - The Diversity and Distribution of Seaweeds of Gujarat Coast is a timely publication based wholly on primary data. Data were collected through extensive and systematic field studies conducted by the authors during different seasons over a three year period. The authors collected nearly 200 species of seaweeds belonging to 100 genera of Chlorophyta, Phaeophyta and Rhodophyta. Twenty-four of the species are new to Gujarat coast and three are new to Indian waters. The book contains high-quality images of the different species in their existing habitats. 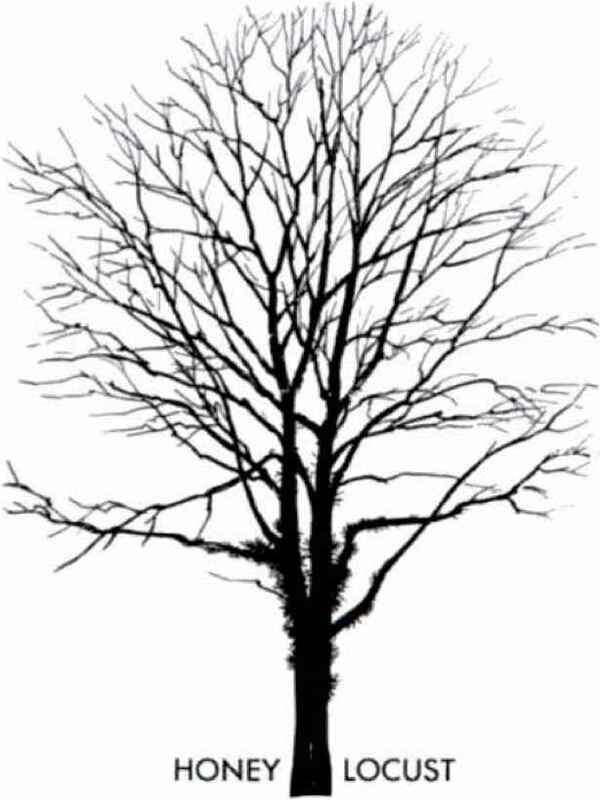 Brief taxonomical descriptions, together with information on ecology, distribution, seasonality and abundance, are covered for each of the species. Where applicable, the economic importance of the seaweed is also highlighted along with references. Molecular taxonomy was utilised to establish the correct nomenclature in certain ambiguous cases and also for those seaweeds which hold out promise as source of high value products such as agarose. 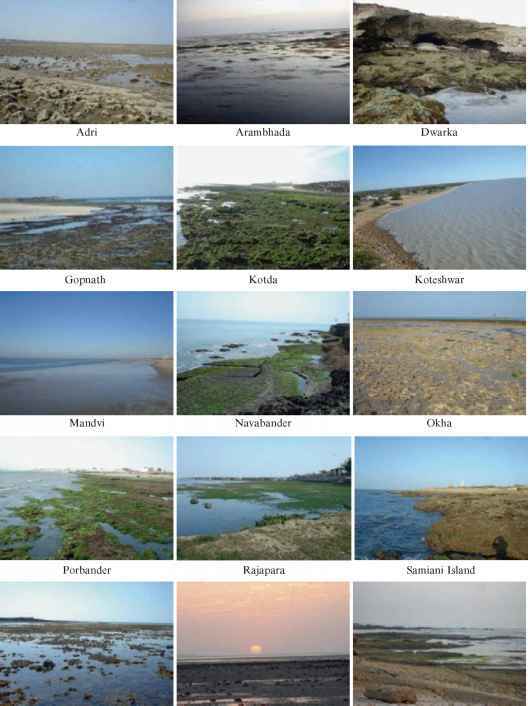 The book gains critical importance from the fact that the state of Gujarat is witnessing rapid development - which will no doubt have a bearing on the coastal environment - and the baseline data on seaweed resources would be useful to understand changes that may arise from physical changes in the environment as also pollution load and climate change. It is pertinent to note that, although Gujarat was largely unaffected by the Asian Tsunami of 2004, the study reflects the postTsunami scenario. Finally, with the recent introduction of mariculture in Indian waters and the expectation that commercial cultivation will be undertaken in Gujarat coast as well, the present work will enable accurate assessment of the impact of such cultivation. I applaud the authors for their commendable work and am confident that the contents of this book will appeal to a large cross section of people engaged in coastal research and development. India has the highest record of seaweed species from the Indian Ocean region. The country has a coastline of 7,500 km with diverse habitats supporting rich seaweed biodiversity. The marine algal flora of Indian coast is largely known from the works of M.O.P. Iyengar and F. B0rgesen who carried out extensive studies on seaweed collections from the Indian coast. Subsequently, F. Thivy, K. Srinivasan, V. Krishnamurthy, T.V. Desikachary, Sreenivasa Rao, Umamaheswara Rao and many others built on this knowledge and published detailed floristic accounts of Indian benthic marine algae. K. Srinivasan was the first phycologist to publish a book entitled Icons of Indian Marine Algae in 1969 enlisting 50 species collected by him from different Indian shores. This book has, unfortunately, been out of print for many years. The subsequent efforts in this direction focused mainly on preparation of checklists of Indian marine algae with geographical distribution and bibliographic references. The first such checklist was published by Krishnamurthy and Joshi in 1970 and has been widely referred to. Subsequently, several updated checklists have been prepared but these are largely based on secondary data and do not necessarily reflect the current scenario. For the first time an effort has been made to bring out an illustrated book on the distribution and diversity of seaweeds of the Gujarat Coast based on systematic survey and collections made during December 2005-December 2008. This may be considered as the first volume under the umbrella of "Seaweeds of India", hopefully with more such volumes to follow. To make the identification process easier, we have provided high resolution colour photographs of species in their original habitat along with geographical coordinates of each location together with the ecology of the surrounding area. Key taxo-nomic characteristics of the species and their known uses are also included. The book is intended to serve as a reliable and up-to-date reference source for students, teachers and researchers engaged in the area of marine algal biology. It will no doubt also serve as a valuable source of useful information for policy planners, environmentalists and marine-based industries. Indeed, the book provides a new baseline for industrially-strong Gujarat against which future changes in seaweed pattern arising from diverse causes such as pollution load, climate change and natural calamities can be monitored. First of all we would like to express our sincere gratitude to Dr. Pushpito K. Ghosh, Director, Central Salt and Marine Chemicals Research Institute (CSIR) for mooting the concept behind the book and providing constructive ideas on the organization of data. The support and encouragement received throughout the project has also been most inspiriting. We would also like to specially thank Dr. B K Ramavat, our former colleague, for guiding us to some field sites during the early phase of this work and for sharing GPS data on some of the collection spots. We also thank Mr. Vaibhav A. Mantri for sharing valuable information on occurrence and taxonomy of seaweeds. Special thanks are due to Mrs. Madhu Pareek and Dr. Avinash Mishra for molecular marker study of Gracilaria species. The assistance rendered by Mr. Santlal Jaiswar, Junior Technical Assistant, during field visits and towards preparation and maintenance of the herbaria of the specimens collected in the course of the project is greatly appreciated. Many other scientists and research students in the Discipline of Marine Biotechnology and Ecology have extended support in one form or the other and we would like to thank them collectively. We would like to thank our drivers for their endurance during long drives - sometimes even at odd hours - and for waiting patiently at each station till the job is done. Our sincere thanks are also due to all staff members in the departmental office and general administration for their co-operation and support which facilitated smooth execution of the work. We are indebted to the Commanding Officer, Indian Coast Guard Station, Okha for providing us with a boat to visit islands in the Gulf of Kutch. We also thank The Port Officer, Gujarat Maritime Board, Okha and Executive Engineer, Public Works Department, Dwarka for extending their guest house facilities during the tenure of this study. The publication of the book would not have been possible without the generous funding from our parent organization, Council of Scientific and Industrial Research (CSIR), New Delhi (NWP018) and the Gujarat State Biotechnology Mission (GSBTM), Government of Gujarat. Last, but not the least, we would like to thank Ms. Suzanne Mekking, publishing editor, Aquatic Sciences, Springer Verlag for her keen interest in the publication of this book. Thanks are also due to anonymous reviewers for their valuable suggestions which helped in giving the book its final shape. Gujarat is situated on the north-western most part of peninsular India between 20° 1' to 24° 7' N and 68° 4' to 74° 4' E (Fig. 1). It has total area of 196,024 km2 and a coastline of 1,650 km - the longest coastline of the country - with a continental shelf of 164,200 km2 (35.3% of the country) and an Exclusive Economic Zone (EEZ) of 214,000 km2 (9.9% of the country). Further, the state has two major gulfs namely Gulf of Khambat and Gulf of Kutch which embrace diverse coastal habitats as well as biota of ecological significance. The Gulf of Kutch is the biggest gulf on the west coast of India in the Arabian Sea and contains 42 islands fringing with corals and mangroves which provide congenial habitat for proliferation of seaweeds, nesting birds and animals. The coastal parts of both Gulf of Khambhat and Kutch region have extensive intertidal mud and sand flats, salt marshes, and mangrove vegetation, particularly in the river deltas of Gulf of Khambhat. The Gujarat coast is composed of deccan traps and tertiary rocks and in places recent alluvium with lime stones with miliolite fossil forms, which are of Pleistocene age. At the Gulf of Khambhat, newer alluvium deposits are found. The tidal cycle on the Indian coast in general is semidiurnal, with two high and two low waters with unequal tidal amplitudes each day. The area of intertidal exposure depends on the tidal amplitudes and topography of the coast. The long stretches of rocky, coralline and limestone substrata of both intertidal and shallow subtidal waters along Gujarat coast, particularly Saurashtra coast is dominated by enormous assemblage of diverse seaweed communities. The coasts where the intertidal zone is gently sloping towards the sea with vast stretches of rocky substrata often exposing and flooding during tidal cycles are found flourishing with wide variety of seaweeds either as open shore formations or sheltered formations (puddles, pools, lagoons, crevices, creeks, etc.). A pure sandy or muddy sea coast harbours few forms compared to hard substrata. The Gujarat coast perhaps surpasses all other coasts in India for the luxuriance and variety of seaweeds. The floristic variations in seaweed communities are controlled by several environmental factors including season, habitat, topography, duration of exposure, tidal amplitude and other biotic factors. The tidal amplitude of the Saurashtra coast, as compared to other parts of the west coast and the entire east coast of India, is very high. This results into maximum exposure of intertidal area, at places extending up to 1 km, especially during spring tides; as a result considerable growth of seaweeds in the intertidal and shallow subtidal regions is observed. Fig. 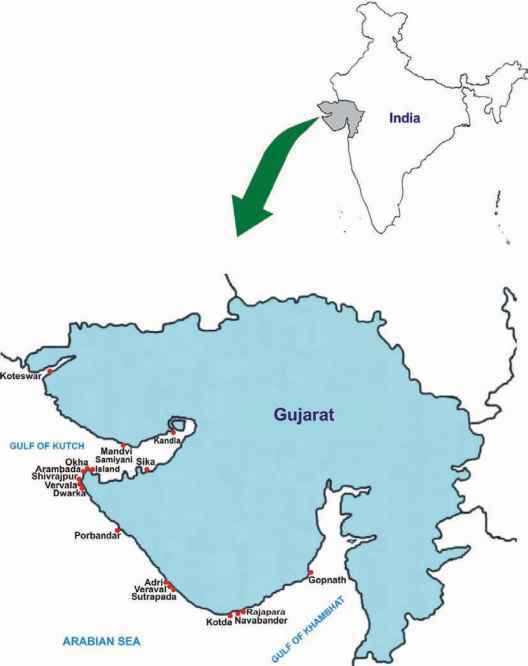 2 View of different seaweed collection sites along the Gujarat coast records from various sources and do not ensure taxo-nomic authentication of species nor their present day availability. Since there is no illustrated book on seaweeds of India, an effort was made to fill the void by bringing out this book through systematic collection, identification and documentation. The Saurashtra coast is rich in seaweed biodiversity, while South Gujarat and Kutch is largely muddy and only few common seaweed species were observed. The entire Gujarat coast was surveyed and fixed select localities for this study purpose (Fig. 2). Based on the relative abundance and seaweed diversity, stations, e.g. Gopnath, Navabander, Kotda, Sutrapada, Veraval, Adri, Porbandar, Dwarka, Vervala, Shivrajpur, Okha, Kandla, Mandvi, Koteswar and Samiyani Island (Gulf of Kutch), were selected for sampling of seaweeds. These stations were visited at monthly intervals from December 2005-December 2008 to collect as many species as possible to have a comprehensive mapping of seaweed diversity. For easy identification, colour photograph of each species in its natural habitat together with well spread fresh specimen and cross sections of thallus showing characteristic features are given. For each species, key taxonomic description, distribution with GPS data, abundance, seasonality, ecology and economic importance - wherever applicable - are also included. Molecular markers such as cox2 - 3 spacer, RUBISCO spacer, ITS1 and 18S rDNA were studied for all Gracilaria species described in the book and the respective NCBI GenBank accession numbers are provided. Total 198 species belonging to 101 genera of seaweeds are described in this book. Among these, 24 species are new reports from Gujarat and 3 (Solieria chordalis, Ahnfeltia plicata and Dictyopteris serrata) from the Indian coast. The Rhodophyta contained the maximum number of species 109 belonging to 62 genera, followed by the Chlorophyta with 54 species belonging to 23 genera and the Phaeophyta with 35 species belonging to 16 genera. Economically important species such as Gelidiella acerosa, G. micropterum, G. pusillum, Ahnfeltia plicata, Gracilaria dura, G. debilis, G. verrucosa, Hypnea musciformis, Meristotheca papulosa, Porphyra sp, Asparagopsis taxiformis, Sargassum tenerrimum, S. plagiophyllum, S. swartzii, Turbinaria ornata, Monostroma sp. Enteromorpha prolifera, E. compressa and E. tubulosa are also present. Caulerpa fastigiata forma delicatula, Enteromorpha ovata, Sargassum swartzii, Grateloupia indica, Helminthocladia clavadosii forma indica, Odonto-thalia veravalensis and Predaea feldmannii var. indica are some of species endemic to the Gujarat coast. Gujarat State is rich in marine bio-resources and is witnessing vibrant growth in industrial and infrastruc-tural sectors. These developmental activities may influence coastal resources. In this context, this book will provide reliable baseline information for monitoring and evaluating the impact of rapid coastal development and to follow floristic changes with time. We hope that the book will serve as an authentic field guide and reference material for students, teachers, researchers and policy planner interested in marine bio-resources and its sustainable utilization. How many seaweed available in Gujarat?